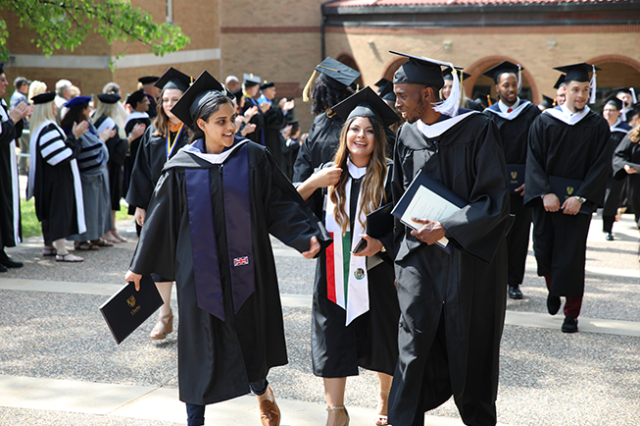 Clarke University’s 175th Commencement was held on a beautiful day on Saturday, May 19. Clarke awarded 307 degrees at this commencement: 204 Bachelor’s degrees, 50 Master’s degrees and 53 Doctoral degrees. Senior Valedictorian Jessica Jordan addressed the graduating class. Jordan’s message to graduating seniors was to pursue your passion and find your happiness. A student, a faculty member, and a staff member were given special awards at the ceremony as well. Senior Kyle Majerus was awarded the Francis J. O’Connor Memorial Award. The most prestigious award bestowed upon a graduating senior, this is awarded based upon the demonstration of leadership, cooperation, generosity, kindness, and academic achievement. The Meneve Dunham Award for Excellence in Teaching, the university’s highest award for outstanding teaching, was given to Jessica Teckemeyer, Assistant Professor of Art. Lastly, Jo Ann Rust, Office Coordinator of Education, was awarded the Rose O’Toole Staff Recognition Award. This award is given annually to acknowledge outstanding achievements that impact institutional success and/or contribute significantly to the mission of Clarke. For more information, contact Clarke University at (563)588-6495.